Weddings are special occasions where not only the wedding party get dressed up but also the guests. It’s appropriate for everyone to look their best and, men, this may mean that a new suit is required. Not just any suit but Wedding Suits! Whether you are part of the wedding party, the family or a guest there are several things to take into account when considering what you want to wear to the wedding. Check the invite to see if there is a specified dress code, what or where the venue is and is it during the daytime or evening. From there, a lot of your decisions will be made easier for you. If you are part of the wedding party, then many of the dress decisions will be taken out of your hands. 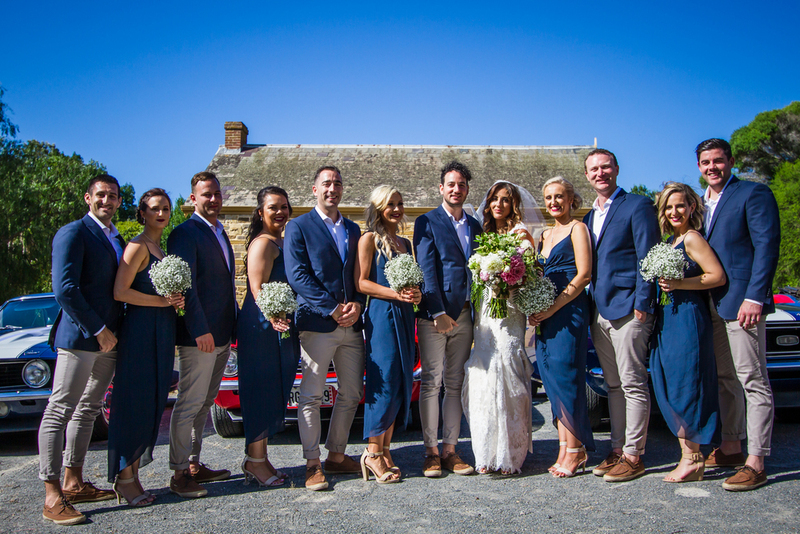 The Bride often chooses the colours required for the female half of the wedding party and the Best Man and Groomsmen will need to dress and/or accessorise accordingly. Let’s look at the specifics of each person or choice you may need to make. The most important thing for the Groom is to match and not clash with the Bride. For example, if the Bride is not wearing white but ivory, then the Groom cannot wear a white suit. He would need to choose ivory to match the Bride or the traditional black would be the safest bet. Out GetUp or Signature Series would be our suggestions. Typically, the Best Man and the Groomsmen would wear a similar suit to the Groom, but not identical. You want the Groom to stand out, be easily recognisable. For example, if the Groom wore white, then the Best Man and Groomsmen would wear black of the same style suit. However, if the Bridesmaids are all wearing a different colour then the matching Groomsmen would probably wearing a matching colour i.e. the Maid of Honour and Best Man could both wear blue and the first Bridesmaid and Groomsman could both be in green. Check out the GetUp range for the suits and our line of accessories to go with them. There are also some great specials on our offers page if you want to purchase more than one suit at a time. Again, it’s important that the Father of the Bride not clash with the Bride. However, as his role is usually a small part of the ceremony, his suit style and cut can be whatever he decides. The colour of his accessories would usually compliment the Bride. Our Signature series is a great choice here and have a look at the range of accessories too. As mentioned earlier, this will depend on dress code, time of year, location and time of day. See below for more specific information in regards to this. There are occasions where the Bride will choose to wear a suit instead of a dress and/or have the Bridesmaids in suits too. 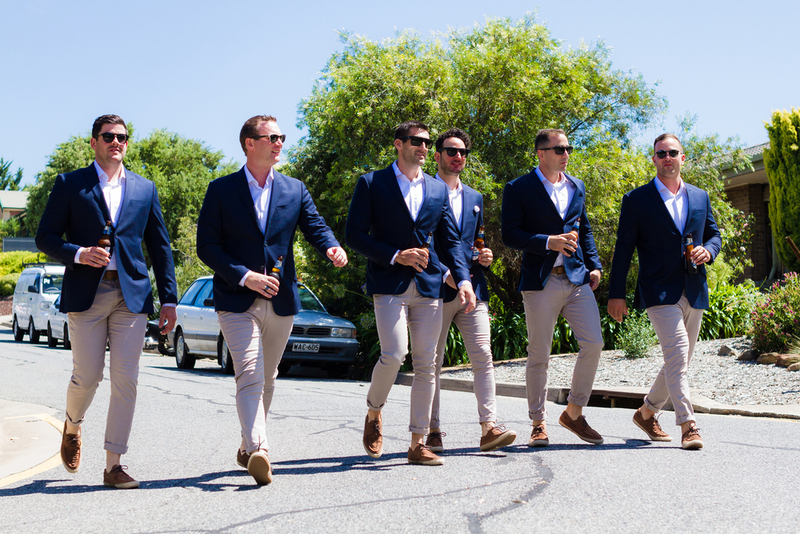 The same considerations that go into the Groomsmen would apply to the Bridesmaids in this instance too. Female guests won’t typically wear a suit unless it is suggested in the dress code. Having said that, it does still happen. The suggestion would be a smart, dress suit, maybe something from our GetUp range. If the dress code is formal then consider a black suit, or any dark colour, with shiny accessories like a satin bow tie. Have a look at our Signature Suit series or even the Luxury Business Editions. This doesn’t mean completely casual, denim jeans and a t-shirt is not acceptable. Sometimes referred to as Smart Casual, the description is suggesting to wear good trousers, shirt/polo shirt, a good sweater and dress shoes (definitely not a sports shoe). You could combine the GetUp jacket with Chinos, a polo top and V Neck Sweater from out Casual range. Typically not the wedding season in Southern Australia, but still a possibility. Ideally, depending on the venue, something warm. Maybe include a scarf or a smart overcoat if you are outdoors. In regards to the suit, something in the GetUp range. Depending on the day, you may need to forego the suit jacket and waistcoat. If in the wedding party, you might need to wait until after the photos before you can take these off. Try to find something that is lightweight but still smart like the GetUp range. This is definitely a warm weather event, the beach wedding is commonly held later in the day to avoid the hot weather. Depending on the location and time of year, it can come in cool rather quick so remember you may need a jacket. Footwear is probably the thing to consider the most here. Something easy to take off to allow you to remove the sand is probably a good idea. Being a summer event, the GetUp range is recommended again. A garden or outdoor wedding is commonly an elegant affair. You will need to be looking very sharp and our Signature series is the choice for this event. Typically a formal event, a Church wedding would probably require the formal dress choices – Signature series and accessories. 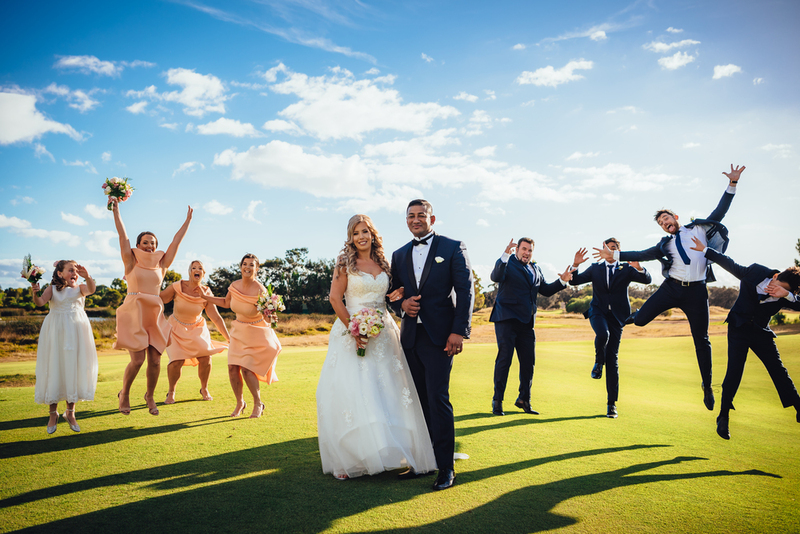 As part of the wedding party, coloured or patterned suits may be suggested by the Bride and Groom but typically, patterned suits are not recommended at a wedding. Bright colours can be a personal choice but not everyone has the personality to pull that off. We recommend the traditional choices of black, grey or dark colours. We think our GetUp Range is a great all-rounder, a suit suitable for any occasion, versatile enough for any weather, location or time of day. For those formal events or the proud Father of the Bride, we have the Luxury Business Edition or the Signature Series. There’s also the casual outfit options for those casual weddings and our accessories will provide the finishing touches.